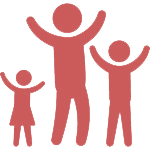 We care about the future of our children and provide practical solutions to problems of adolescent youth. 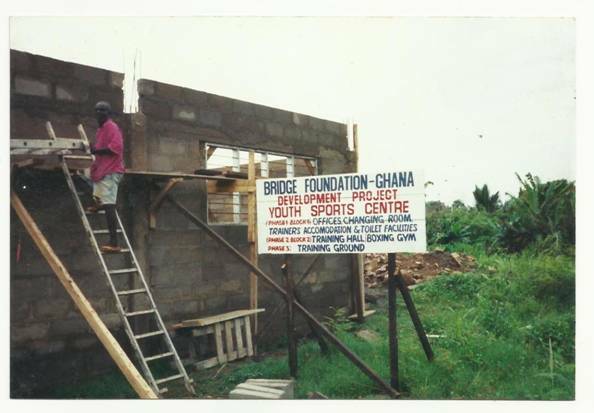 The Bridge Foundation (TBF) was founded in 1998 by Ambassador Ray Quarcoo, whose vision is to build a society where young people are enabled to maximize their potential to achieve an improved quality of life free from exploitation.TBF provides opportunities and resources for participants to build socio-economic skills through formal education, vocation/life skills training and sports development. Building a society where children and young people are enabled to maximize their potential to achieve an improved quality of life free from exploitation. 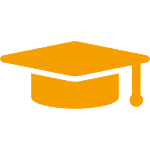 To empower disadvantaged children /young people with skills that will enable them reach their full potential. Poverty can shape whole communities for generations. The best strategies for combatting its effects and progressing into better future must come from within the community itself. The Bridge Foundation believes that children in deprived communities are true development experts. 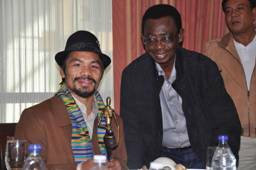 Its ambitious young people have resounding hope and remarkable creativity. They have the talent and initiative to create real, sustainable change. Often times all they need are the resources and some support network to help their ideas thrive. Through our work, we seek to break the cycle of deprivation and poverty. We empower our children and young people to overcome the challenges they face that hold them back. We develop our programs in the context of local circumstances, in partnership with children, young people and their families, as well as community leadership and local authorities. These programmes are designed to benefit: TBF desires to assist disadvantaged youth from impoverished homes (orphaned and neglected children, street children, unskilled out-of-school youth, etc) in Accra and Kokrobite. Community outreach services are offered to youth ages 7-19, whose household income falls within the programme requirements. Through TBF mentorship programmes, assistance is also available to support participants families and schools with educational resources and related training. 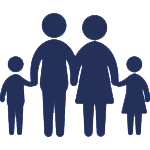 We work to change lives: The Bridge Foundation works for families who find themselves under severely difficult circumstances.You can help these vulnerable children, young people and families now before it is too late by donating here. 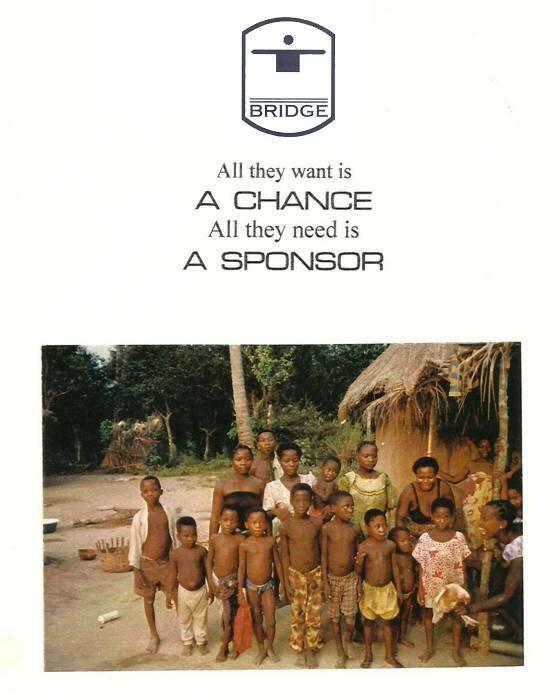 The Bridge Foundation is the easiest way for you to help children and young people at your doorstep. The Bridge Foundation facilitates provision of formal education, vocational and life skills training to children and young people, especially that out-of-school who are trainable, as well as providing them with equipment and tools to practice their acquired skills. TBF runs a multi-purpose resource and training centre which provides a safe and protective environment for at-risk youth; fostering the needed support network for the provision of basic needs and development through education programmes, one-on-one counseling services and an ongoing atmosphere of concern and hope. Every child deserves education; TBF makes it a reality for all the children who come to our resource centre. 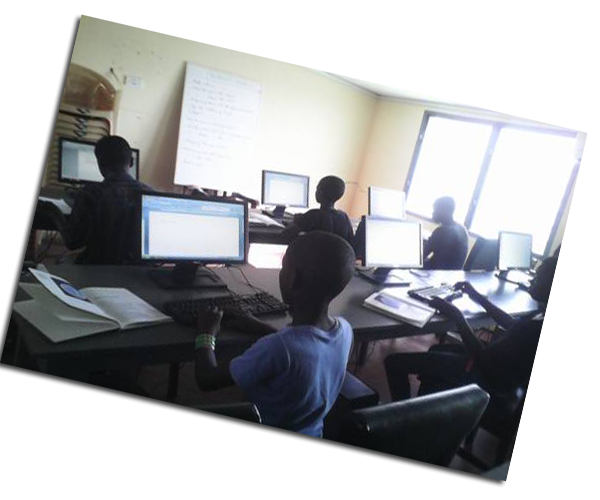 We offer basic literacy and computer skills training, as well as art and craft to under-privileged children and young people. 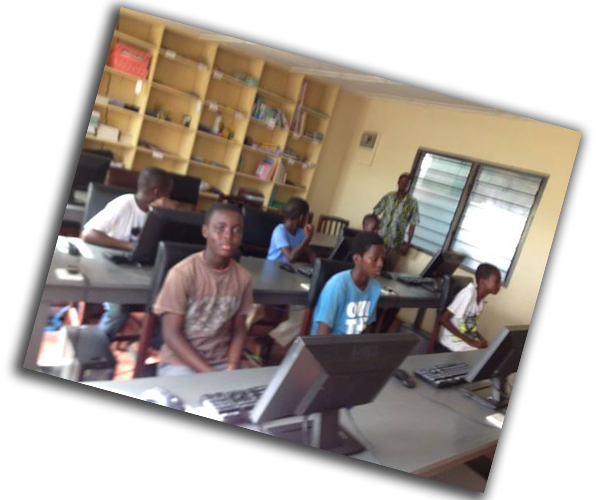 So far, over 150 young people have graduated from the Computer Skills training since the inception of the programme. 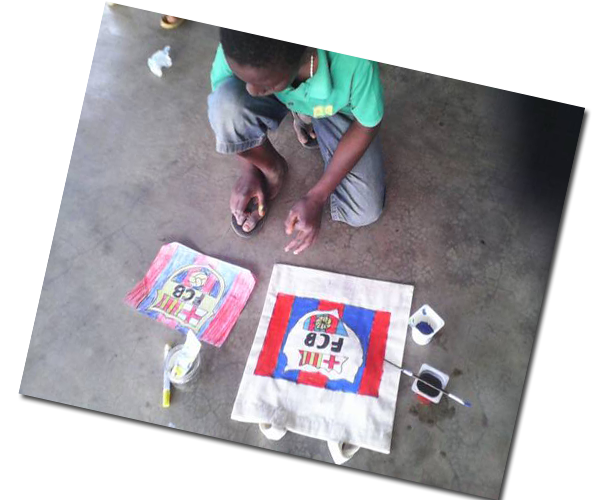 TBF supports vocational skills training to youth out of school, equipping them with tools after their training to enable them engage in employable trades to earn decent living. Field officers identify trainable unemployed youth who then are apprenticed to master tradesmen. 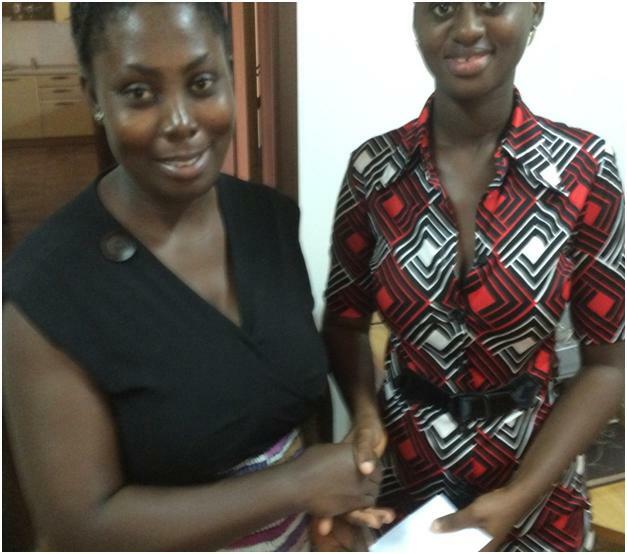 Rose Awatey, 18yrs, is one of 10 beneficiaries of our vocational skills/formal education support and sports development programme; completed Accra High Senior High School in 2014.First of a family of four; dropped out of school at Junior High School because her family could no longer afford her school fees. A friend directed her to TBF. On her introduction to the programme; beaming with excitement, she said I am hopeful life will not be the same, with this opportunity, my life will get better. She is a member of the national amateur female boxing team and currently on scholarship studying in the United States of America. 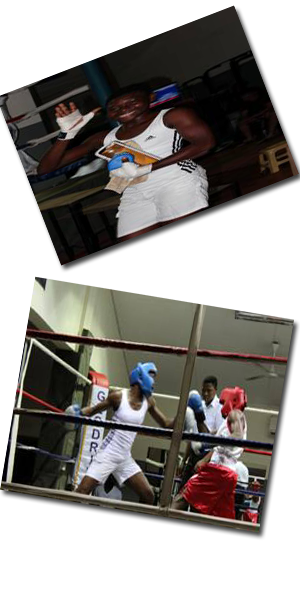 L-R: Rose in an exhibition fight with a male counterpart at the Bridge Gym, Roman Ridge, Accra, Ghana. Practical skills leading to job opportunities. Promoting sports development, wellness and healthy lifestyles. Experience the vibrant diversity of the Ghanaian culture while making a difference at the grassroots level. This experience can make your resume outstanding. Our activities are designed to bring a sustainable high impact output after completion.Programs are available throughout the year. Be a part of TBF's efforts to inspire learning, innovation and action to unlock the potential of vulnerable children in Ghana. 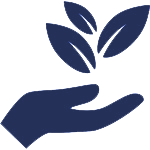 Work with exceptional grassroots projects in community development, personal development, and fundraising. Be part of a progressive nonprofit that has raised support for over 1000 children in need. Make a long-term impact in your community of choice it is not just a vacation. Hailed as West Africa's golden gate, Ghana deserves its place under the sun. One of Africa's great success stories, Ghana is reaping the benefits of a stable democracy in the form of fast-paced development. come here for a week or a month, but no trip can be complete without a visit to Ghana's coastal forts, poignant reminders of a page of history that defined our modern world. Travel north and you will feel like you have arrived in a different country, with a different religion, geography and cultural practices. The beauty is that this diversity exists so harmoniously, a joy to experience and a wonder to behold in uncertain times. What all Ghanaians share are their hospitality and a penchant for socialization, placing them amongst the happiest, most welcoming people on the planet; and positioning Ghana the most idyllic place to volunteer. 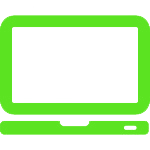 Â· Subsidized 24/7 in-country support. 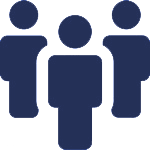 Â· Travel costs to inspect programs and communication costs with volunteers. Â· In-country trips or tours and spending money (volunteers in Ghana generally find US$30 to be sufficient for basic weekly expenses). 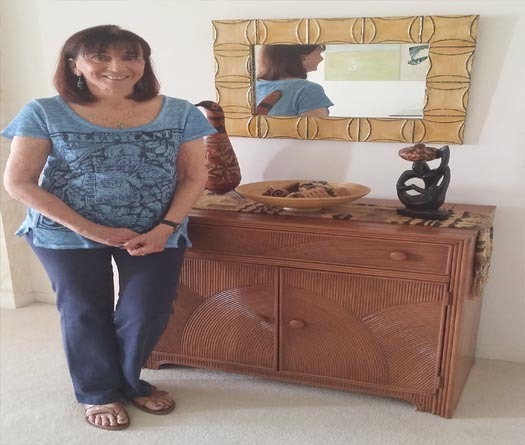 TBF works in partnership with other non-profit organizations and institutions that share common vision; and also extensively through a network of volunteers, both local and foreign. TBF therefore welcome volunteers who would want to work with us for the betterment of lives of disadvantaged children in Ghana. Travel costs to inspect programs and communication costs with volunteers. In-country trips or tours and spending money (volunteers in Ghana generally find US$30 to be sufficient for basic weekly expenses). TBF is a registered Ghanaian non-profit organization incorporated as such under relevant laws of Ghana and recognized by the Department of Social Welfare with Certificate Number DSW 988. We have received and placed several volunteers and many of these volunteers are active in sharing their experiences through social media platforms. If you wish to talk to a TBF staff member, please free to contact us. TBF was established to provide affordable, high quality and responsible volunteer/internship programs for people wishing to volunteer in Ghana. It is built on the following strong values: - affordability, responsibility, support, safety, friendship, loyalty, quality, experience and enjoyment. Do You Want to Hep? Our vision is to connect volunteers with communities in need, with a particular focus on vulnerable children. We do this by supporting the work of local communities and schools through the placement of volunteers and interns. People volunteer for a wide variety of reasons, especially wanting to help others. But it is also acceptable to want some benefits from one volunteering. The best volunteering does involve the desire to serve others, but this does not exclude other motivations, as well. Instead of considering volunteering as something you do for people who are not as fortunate as yourself, begin to think of it as an exchange. Volunteering is founded on the concept of giving through the donation of your time, your skills, your energy, and often just simply your presence to help others in need. 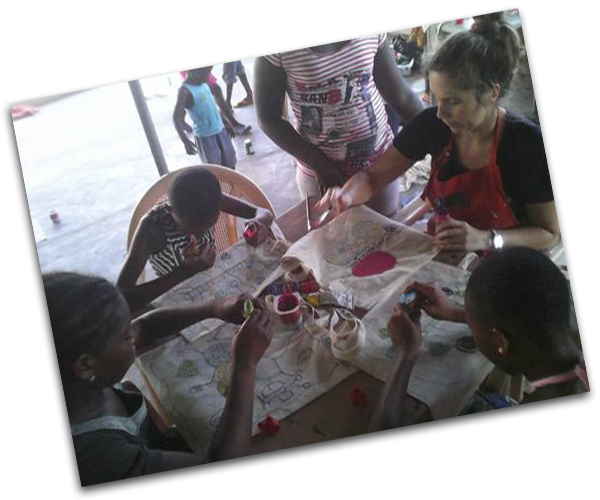 The lessons and benefits that a volunteer receives while volunteering abroad are endless and can include increased self-confidence and social awareness, development of life skills, personal growth, friendship and building of independence. It can also help to enhance your career prospects. Not only do volunteers increase their skill base, work experience and international contacts through volunteering abroad, employees often look favorably upon those who are willing to go outside of their comfort zone and give up their time to assist others.